RESIDENTS OF COUNTY Clare have been warned that its council will be cracking down on any illegal waste activity from now on. 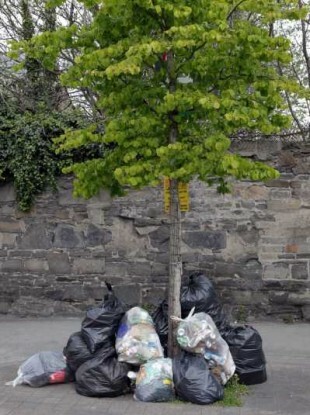 Increased monitoring of practices such as fly-tipping, backyard burning and unauthorised waste collectors has been announced as the council secured a number of prosecutions at Ennis District Court recently. The court imposed heavy fines of over €2,000 against three individuals over the illegal disposal of waste, as well as awarding costs to the council in all cases. Clare County Council says waste enforcement staff have expanded their inspections and patrols in areas vulnerable to illegal dumping to night-time and weekends. Such work is carried out regularly and in conjunction with other local authorities and the Gardaí. CCTV surveillance to detect illegal waste activity is also being utilised. Despite some good progress, fly-tipping and illegal dumping have remained a problem in the county, explained executive engineer Robert Burns. Clare County Council, Ennis Town Council and Kilrush Town Council have said they will pursue anyone involved in the activities to “the fullest extent possible under the law”. Fines of up to €3,000 and a prison sentence of up to 12 months could be handed down if a person is found guilty in court. Meanwhile, a reminder has also been issued to the public that it is illegal to give waste to an unauthorised collector, as persons involved in the collection of waste must have a valid waste collection permit. Burns also noted that backyard burning is against the law. Complaints received by the Environment Directorate are followed up on by a site visit by the Patrol Warden, leading to resolution on site and/or warnings (verbal and written)/issue of fines or legal proceedings. Initial investigations may also lead to further visits to sites by engineers or scientists and to the issuing of enforcement notices. Clare is home to five recycling centres at Ennis, Shannon, Inagh, Lisdeen and Scarriff. There are also 53 bottle and can bank sites throughout the county. Email “Clare cracking down on illegal dumping ”. Feedback on “Clare cracking down on illegal dumping ”.